We have performed research on the user experience around the history pilot tools we are developing in Europeana Creative. This research was done together with teachers from different countries: United Kingdom, Spain, Portugal, Italy, Netherlands, Germany, France, Poland and Austria. The activity took place in the Institute of Education, London during the international training seminar “History beyond textbooks” organised by Euroclio. The UX session was divided into two sessions. 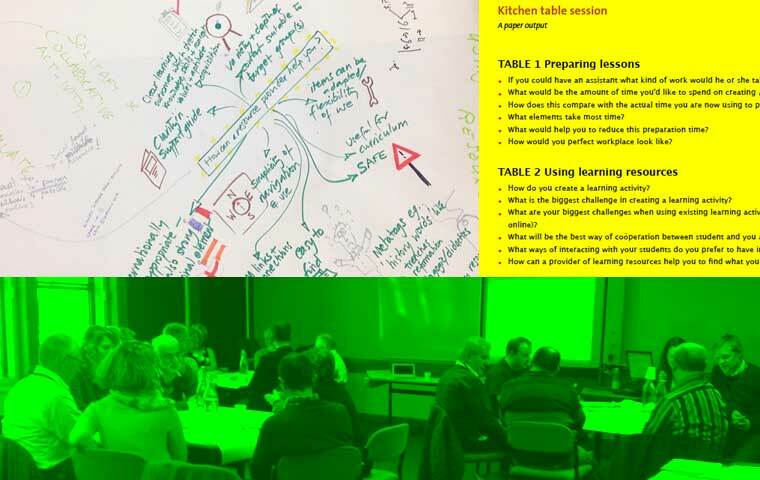 The first session focused on getting feedback about the existing website, printed learning materials and the two tools under development (compare and contrast, and visual analysis of sources). Teachers’ feedback was either submitted online during the event or handed over on paper immediately afterwards. • If you could have an assistant what kind of work would he or she take over from you? • What would be the amount of time you’d like to spend on creating / preparing a lesson? • How does this compare with the actual time you are now using to prepare a lesson? • What elements take most time? • What would help you to reduce this preparation time? • Describe your perfect workplace! • How do you create a learning activity? • What is the biggest challenge in creating a learning activity? • What are your biggest challenges when using existing learning activities (either book or online)? • What are the most effective ways of cooperation between students and you as teacher? • What ways of interacting with your students do you prefer to have in your learning? • How can a provider of learning resources help you to ﬁnd what you are looking for? • What could it do? • How would it look and feel? • What kind of sources would you need? • How would students and teachers interact with the tool? • How would you like to communicate with the students before they start working with the tool? • Do you want it to be a group or individual activity? • How do you want the results to be measured/collected? obtaining insights about how teachers work throughout different countries. From these results we will define a framework of bottlenecks every teacher is facing when working with online tools and create guidelines for developing new educational tools for the modern society. With these guidelines we will fine-tune the betas of our educational tools and sketch new possible tools that are of real benefit to the teacher.